THE BLACK POWER MIXTAPE 1967-1975 mobilizes a treasure trove of 16mm material shot by Swedish filmmakers, after languishing in a basement of a TV station for 30 years, into an irresistible mosaic of images, music, and narration chronicling the evolution one of our nation's most indelible turning points, the Black Power movement. Featuring candid interviews with the movement's most explosive revolutionary minds, including Angela Davis, Bobby Seale, Stokely Carmichael, and Kathleen Cleaver, the film explores the community, people and radical ideas of the movement. 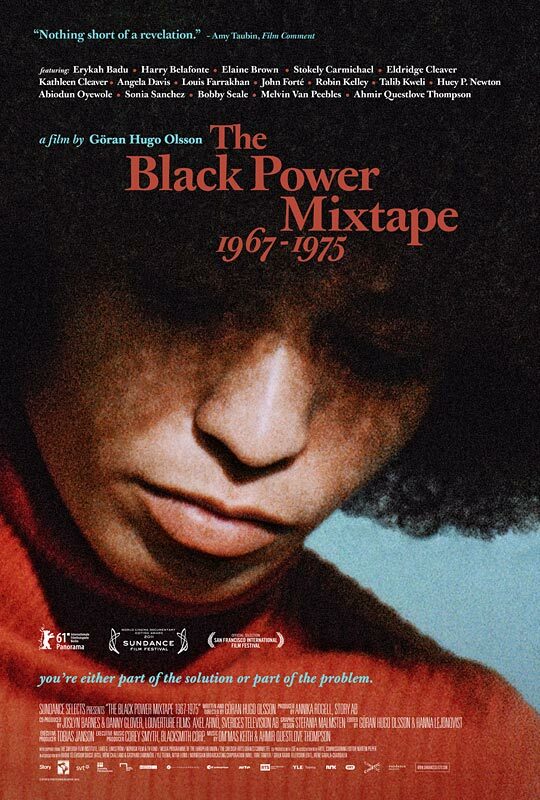 Music by Questlove and Om'Mas Keith, and commentary from and modern voices including Erykah Badu, Harry Belafonte, Talib Kweli, and Melvin Van Peebles give the historical footage a fresh sound and make THE BLACK POWER MIXTAPE 1967-75 an exhilarating, unprecedented account of an American revolution.